I bet you are thinking is the Queen of Hearts now into Home Inspections??? No that is not be case, however I know I good book when I read one. I will tell you that this book, will blow your mind. 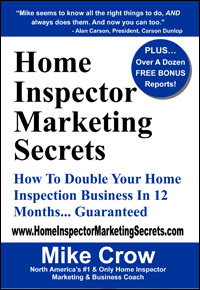 Not only does Mike Crow breakdown how inspectors can be better but every person in business should purchase this book, it is filled with secrets to success. The top five secrets I want to highlight are: 1. Have a BURNING Desire; 2. Have SPECIFIC Knowledge; 3. Be Disciplined; 4. Be Decisive and 5. Find yourself a Mastermind Team. Run and pick up this book today.